The May issue of the Scottish Curler magazine is now out, and is in the mail to subscribers. The last issue of the season contains news of Rhona Martin's retirement from competition to take up a coaching position, as well as reports of the Scottish Mixed Championship, the National Pairs, the Scottish Schools', the Scottish Wheelchair Championship, the World Seniors', the World Women's and the World Men's. Plus all the usual features. According to the Herald today, the Magnum complex at Irvine, which has a skating/curling rink, may close. More details when they become available. The Magnum holds a special place in my memory as we represented the rink when we won the Scottish Championship back in 1983! Following the fire which damaged the Kirkcaldy rink in March there has been considerable speculation whether the rink will open again for curling. The news is good. The insurers have agreed the claim and work is well underway to ensure that the main structure of the building is sound. Asbestos which had fallen on to the ice surface has been cleared away and Health and Safety are satisfied that there is no asbestos dust in the building. Work has begun on repairing the roof. Good news for curlers is that popular competitor and great supporter of the sport, Lynne Stevenson, has been elected to the rink's Board, and she is now Director of Curling. Her job will be to listen to the concerns of the curlers and oversee anything pertaining to the sport, eg the quality of the ice, and the running of competitions. 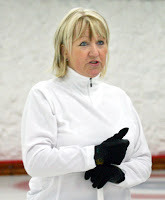 Lynne's photo is from last season's Scottish Seniors' Championship. LAST season a very successful CURLATHON was held at Inverness to raise money for the Highland Hospice. The Curlathon is back next season on September 14-15 at the Braehead rink. The event is being organised to raise funds for two hospices, St Vincent’s Hospice and the Highland Hospice. The format will be similar to that of the Grand Match with teams from the north of the Forth representing the Highland Hospice and teams from the south representing St Vincent's Hospice. Teams play in one session during the twenty-four hour period, each session having a theme, with teams expected to dress accordingly! Each team taking part commits to raising sponsorship of £400. The final session on September 15 is for celebrity sides. The most recent teams to enter for the International trophy are Rhona Martin’s Olympic side, and Jackie Lockhart's 2002 World Champions. According to Braehead's Judith McFarlane the event is receiving great support from local clubs, but there is still room in the draw for others to enter. Ninety-eight teams are needed. The organisers at Braehead promise complementary drams/refreshments and nibbles between ends, goody bags, video coverage of the event, entertainment within the bar with twenty-four hour catering and bar services, a family day packed with activities around the event, and great prizes! Your team should be part of this big event. Join up, have some fun, and, most importantly, raise money for a good cause! And yes, a Scottish Curler team is signed up. That should be worth a photo or two! My name is Bob Cowan and I have been Editor of the Scottish Curler magazine for five years. Over the coming summer months the team will be setting up the Curling Today website, and this blog will tell you how we are getting on. Curling Today will be the online partner of the Scottish Curler magazine, a print publication that has been around since 1954! What will be the aims of Curling Today? It will promote the sport of curling, and be an independent voice for the sport, just like the magazine. It will inform and (hopefully) entertain. Particularly, the website (and this blog) will bring news faster than the magazine can, and feature competition reports and photographs. It will focus on Scotland's curling teams and their sponsors! The website will complement the magazine, not replace it. So, if you are interested in the sport of curling and feel that curlers in Scotland should have an independent voice, we'll be looking for your support. The 2006-07 season has just finished. The May 2006 Scottish Curler, the last issue of the season, is at the printers. Have a great summer. The Scottish Curler team is already looking towards next season!